This machine has been expressly designed to provide a sandblasting/shotpeening machine with reduced dimensions and costs for the treatment of small parts in contained quantity. This machine has very reduced dimensions and has been designed to be rested on a bench suitable for working even sat at a table. The working jet is obtained with the so-called "suction pressure" system. • Centrifugal aspirator with 220 Volt single-phase feeding. • Filtering bag to collect the working powders. 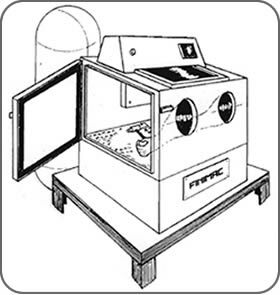 As an alternative, cartridge filter in compliance with EC regulations. • Dehumidifier for compressed air. • Pressure regulator with pressure gauge. 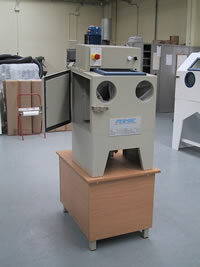 • Sandblasting/shot-peening gun with trigger control and tungsten carbide nozzle (widia). • Window with laminated glass. • Booth lamp, assembled inside the cap, externally to the working area. • Anti-abrasion gloves with integrated sleeve. • Rest surface made of punched plate. ** Overall dimensions and weight are given just as an indication. *** Compressed air consumption is calculated for a 6 bar working pressure; working with lower pressure, consumption will proportionally decrease. 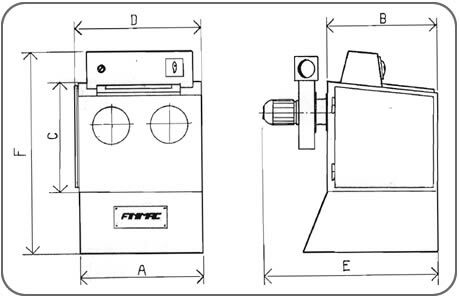 Finimac produces other types of manual machines with different dimensions beside the machine described in this catalogue. 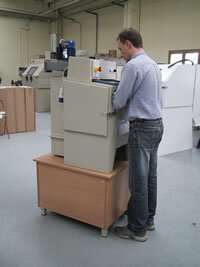 Furthermore, Finimac also produces motorised machines for higher productivity.